Indexing a website within 24 hours is easy but showing it on the first page of Google takes time and depends on the keywords you are using. This article was originally posted from Filipino Bloggers Worldwide Facebook group. A group of bloggers were asked on ways to get their blog post indexed by Google fast. 2. Create a Sitemap and Submit to Google Webmaster Tools. 3. Submit your RSS feed. 5. Bookmark It. Use quality social bookmarking sites like StumbleUpon and Delicious. 6. 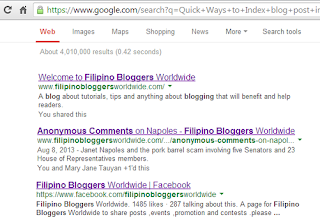 A link from a blog with high PR will make indexing faster. 8. Make your content 100% unique after 30 seconds it will get indexed regardless of PR. 9. Your primary concern is to exploit the power of CMS before doing SEO. 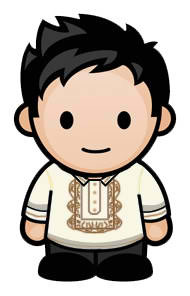 Make use of the existing capabilities of my CMS. 1. Check your blog template if it is SEO-friendly. 2. Are the plugins you use not hurting your site's loading performance? 3. Are your articles important to the readers? How many of those out there wants to know how your neurons work compared to the "BRAIN of Vice Ganda? ", you want traffic so find the interesting topics. 4. Do not cheat. Spammy backlinks worth nothing. If you have something to add or any other way to get indexed quickly, please share by leaving a comment below. Google Updated its indexing system in 2010. The update was called Google Caffeine. It was designed to index all pages as fast as possible for a more user-friendly results. So it's not really necessary to submit a sitemap or Google Analytics. Once your website is launched provided that it is accessible to Google bots and other search engine crawlers, you can get your site indexed in less than or within 24 hours. this site is very informative and helpful for newbies bloggers like me. 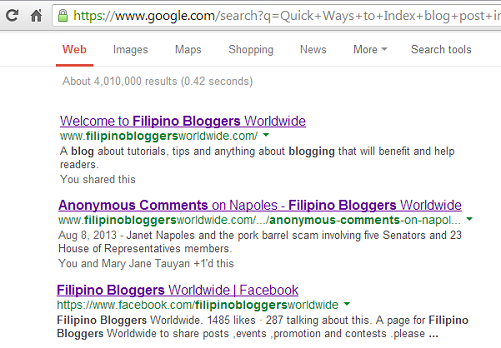 thanks for the effort Filipino Bloggers Worldwide!